Janus EMS emergency telephones are a forerunner in the industry. Installed by all of the major elevator companies, they have come to trust our elevator ADA emergency telephone systems to provide ASME code compliant service in North America. 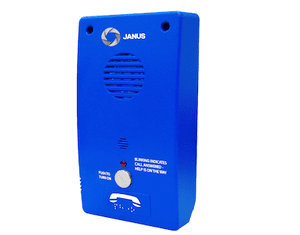 The entire Janus EMS emergency telephone range are CSA certified and FCC approved. The MG3 is a true drop in replacement for an Otis Nogales phone. The EMS emergency telephone system provides trapped passengers with an easy, hands-free connection to emergency help. The Janus EMS5 Call Director connects up to 8 EMS emergency telephones to a single telephone line, helping reduce operating costs. The Janus Master Station Phone provides two-way communication between the lobby or fire control room and the elevator phones on an EMS5 system. The Janus Machine Room to Car Intercom works with any type of ADA-compliant elevator telephones, allowing a low-cost, easy-to-install retrofit solution. The Point-to-point intercom system provides communication between the lobby or hall station and the elevator car. Machine room-to-car communication is also available in this format.